Jazz up your life with this beautiful abstract music design. 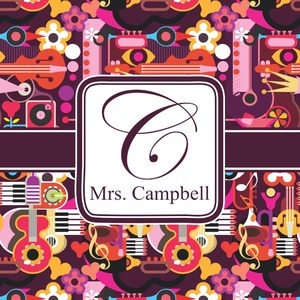 Anything made in this pattern is a wonderful choice for a music lover or a great gift for a music teacher! The design features musical instruments, hearts, notes and is that a crown mixed in there? It is colorful design with tones of plum colors along with pinks and oranges. It is an interesting and beautiful multicolored design. The design also features a classic ribbon, along with a square label and a name & initial for the personalization of your choice.